I was truly delighted to be part of the Bhutanese delegation to participate in the Australia Awards South and West Asian Regional Alumni Workshop which was held in Kathmandu, Nepal from 17-18 November 2016. There were five of us from Bhutan who were selected to take part in the workshop themed “Education for All”. Although the Bhutanese team members were new to each other, we quickly developed acquaintance and made up an excellent team. On 16th November, we had a pleasant flight from Paro International Airport to Kathmandu and the services provided by the flight crew of Bhutan Airlines were excellent. We had an early morning flight and we landed at Tribhuvan International Airport in Kanthmandu, Nepal early. As soon as we checked out of the airport, we were escorted to Hotel Yak and Yeti where our accommodation was arranged. I had an appointment at 11:30 am on that day for a case study interview and hence, I could not go anywhere in the morning. In the afternoon after one of our team members finished her interview, we went out to explore the city and to visit some nearby places. 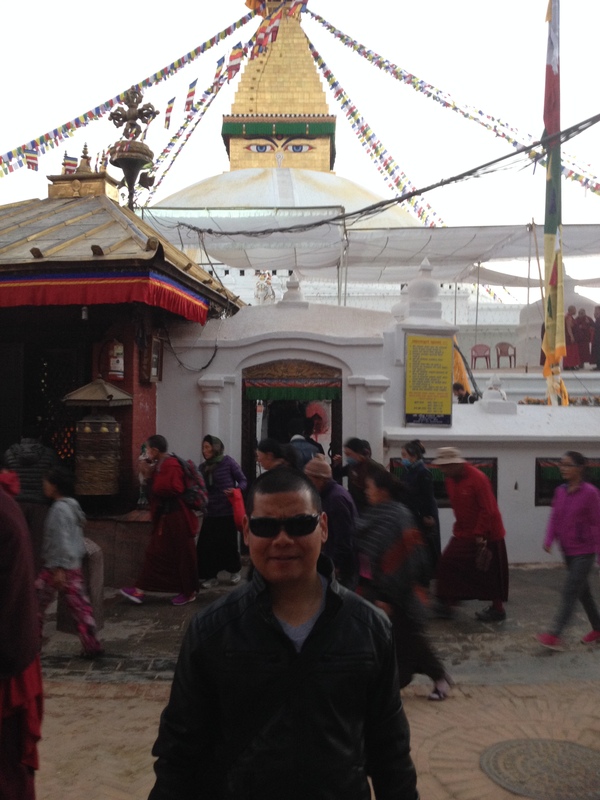 One of the first sites we visited was the sacred Boudhanath Stupa which was not so far from our hotel. 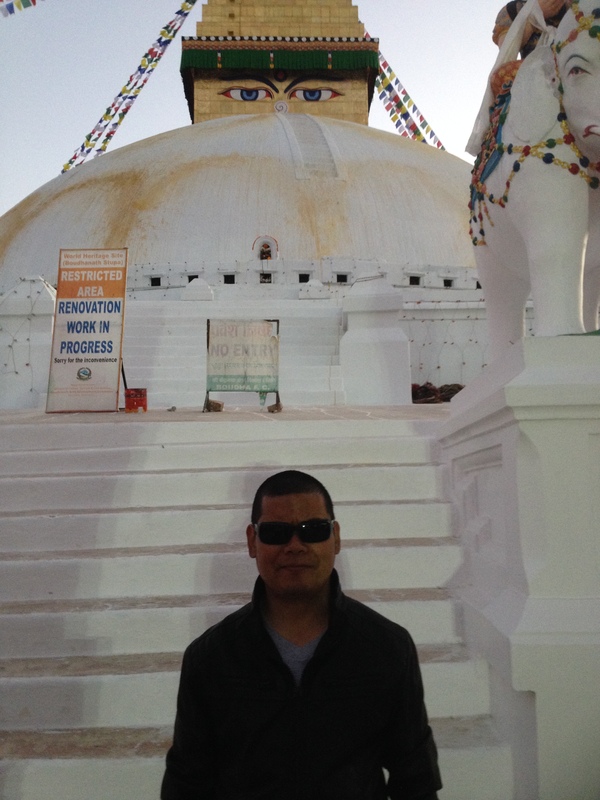 Measuring about 36 meters high and 100 meters wide, the stupa is said to be the largest monument in Nepal. Designated as the UNESCO World Heritage Site in 1979, it is the heart of the growing Tibetan Buddhism in Nepal and serves as an important part of the Tibetan community in Nepal. There were hundreds of people circumambulating the sacred stupa chanting prayers. I and my friend completed eleven rounds. The entire atmosphere was filled with life and music as the melodious hymns and Buddhist prayers from the loud speakers released positive energies into the air. After hours of circumambulation, we entered the attached temple to offer prayers and butter-lamps. After that, we went to Thamel to do some shopping. By then it was already late and we had to rush for dinner at a local restaurant before heading back to our hotel. The next day was very exciting. The workshop began at 8:45 am after a special breakfast treat. The 1st day of the workshop basically included presentations from 7 South-Asian countries on inclusive education practices in the region. 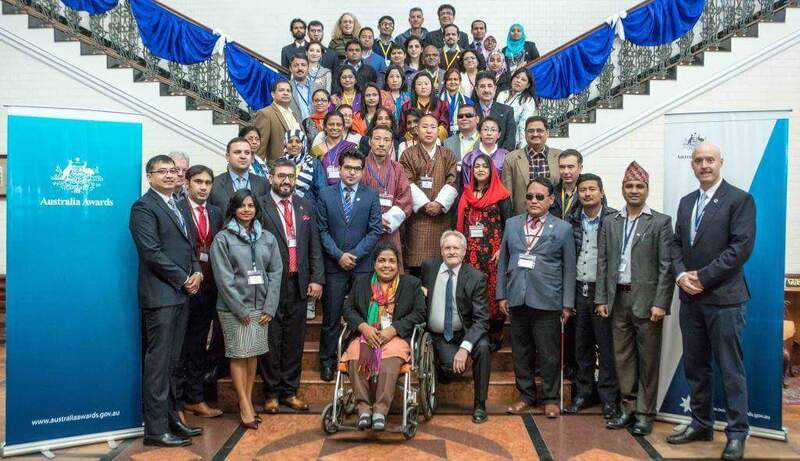 It was a wonderful opportunity for all of us to learn from each country various aspects of inclusive education and some of the best practices and challenges of inclusive practices in the region. The facilitator of the workshop, Prof. Suzanne Carrington of the Queensland University of Technology in Australia also shared her experiences and wisdom about inclusive education and inclusive practices. The topic of presentation assigned to the Bhutanese team was “Inclusive education in schools (culture, policy and practice) and Mr. Ugyen Namgyel from His Majesty’s Secretariat did the presentation on behalf of the team. Our presentation highlighted the importance we attach to GNH values while framing any public policy and how these values help us promote inclusive practices in the country. The overall presentation was comprehensive and it drew the attention of many delegates especially when we talked about Gross National Happiness, the sacred philosophy that guides our public policies and plans at all levels. The 2nd day of the workshop was equally exciting. We went on field visits to different institutions to observe and understand some of the inclusive education practices in place. My group went to an integrated school where the visually impaired students study together with the sighted students in the same learning environment. Other groups went to different institutions: one went to the school for the deaf and the other went to the autism care. Upon our return to the conference room, we shared our observations and the lessons we had learned from the field visit. That gave us the opportunity to get the overall picture of various inclusive practices in Nepal. The evenings were full of fun. We walked in team to Thamel to do shopping every evening. We bought winter cloths and other things we stumbled upon in the shopping complexes. Unfortunately, the two days flew away within no time. Soon it was time for us to leave Nepal. On 19th November, we had to pack up our things and leave for the airport early in the morning for our flight back to Bhutan. All my team members were very supportive and cooperative. I would like to thank each member for the wonderful time we had together in Kathmandu. I look forward to meeting you all on a similar journey some day in the future again. Nice post, Sir! I am glad you could go to Nepal and had experienced a lot of fun, including your visit to a surrealistic town called Thamel. Kathmandu is a very vibrant city. Initially I thought your office sent you there, but I know the reason. Indeed, you are inspiration to not only Bhutanese but people from other countries too. Keep writing and hope to see you soon! Thank u Rikku for the encouraging comment as always. No, it was not official.